The app will launch Thursday in the U.S., U.K., Canada, Germany and France for iOS and Android. 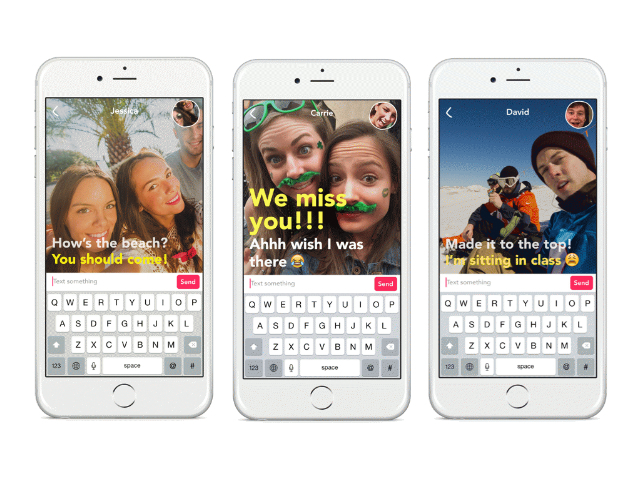 Yahoo is getting back into the messaging app game, announcing a new video chat app — Livetext — that stays silent. The app will launch Thursday in the U.S., U.K., Canada, Germany and France for iOS and Android. The app connects friends in a video live chat session, allowing them to type out responses, but doesn’t use audio. Livetext connects Yahoo users, so you’d need to know your friend’s Yahoo ID. If the user chooses so, it can match up Yahoo IDs with contact info in the phone. If you try to chat with someone who doesn’t have Livetext, you can send them a text message with a link to download the app. Yahoo has been testing Livetext in Hong Kong, Taiwan and Ireland, and will release the app Thursday in the U.S., U.K., Canada, Germany and France. Every platform shift leads to new forms of communication, driven by our desire to connect and interact in richer ways. We wanted to create a new way to communicate, blending the simplicity of texting with the emotion and immediacy of live video, to make your experience spontaneous and real. Readers: What do you think of Livetext?